A child prodigy, Amy is Team Satomi's midfielder and battle tactician. 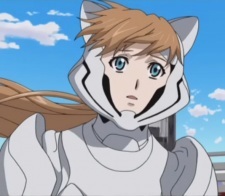 She, being the physically weakest of the team, synchronizes with her cybernetically enhanced calico cat, Luca (ルカ Ruka?) (Vanilla Yamazaki, Kari Wahlgren), to form a composite personality during IGPX Races. Quiet and sympathetic, Amy will often patch up conflicts between other team members, but her sweetness belies her considerable combat abilities. In season 2, Amy is injured in Satomi's race against White Snow. Andrei replaces her for both Velshtein vs Satomi and Skylark vs. Satomi matches. Throughout the series only Amy could hear Luca's 'voice' while racing with him in her mech. However, at the end of the series, at the beginning of Satomi's first race of the 2051 racing season, it is revealed that now all members of Team Satomi can now hear his voice. In episode 4, "The Ghost", it is revealed that Amy dearly misses her parents, who are always out on business.